On the face of it, the two colonies could not be more different — New Rajender Nagar with its swept roads, well-tended dustbins and Jhilmil Colony with overflowing dhalaos and unaware residents. 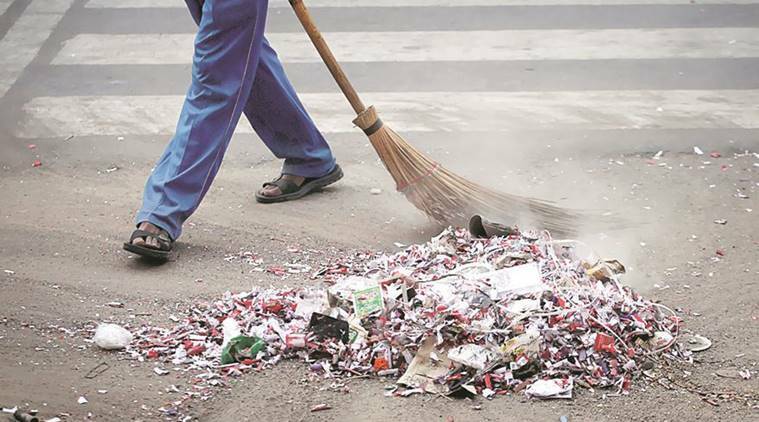 But in both places, the pilot project for source segregation of waste, as part of the Swachh Bharat Abhiyan following Prime Minister Narendra Modi’s announcement on World Environment Day on June 5, 2017, has been swept under the rug. The two were among the 10 colonies that the north and east corporations had identified as sites for the pilot project. At New Rajender Nagar, the effort lasted for roughly a week. At Jhilmil Colony, it never really took off. The problem, officials said, was not due to lack of funds, as in 2016, the EDMC had failed to utilise the Rs 41 crore and the North MCD the Rs 41 crore allocated. “It’s a problem of intent, and planning doesn’t trickle down to the ground,” said an official. The North MCD estimates that the 3,000-odd households of New Rajender Nagar produce about 10 tonnes of waste daily, which ultimately land up in its 22 street-corner bins, and finally at its sole dhalao. Following the orders in June, the corporation distributed 697 blue and green dustbins to segregate trash along with instructional pamphlets. In comparison, Jhilmil Colony, with its 5,000-odd households, is densely populated and produces at least over 13 tonnes of waste per day, including that from the adjacent industrial area that lands up at its nine dhalaos. But, as per the councillor, the area had “received 40-odd dustbins”. However, this is not New Rajender Nagar’s first tryst with segregation of waste. D M Narang, RWA president of R block, said such a plan was introduced in 1962 but it failed due to lack of cooperation from residents. North MCD mayor Preety Agarwal said, “The plan is to try and make Delhi free of landfills. But for that we need cooperation from the public…” But the scenes at the dhalaos in the two colonies paints a grim picture. The major bulk of segregation at New Rajender Nagar continues to be done by safai karamcharis, and at Jhilmil Colony, entirely by them. At the only dhalao in New Rajender Nagar, visited daily by 30 private and government rehdis, Arvind Kumar instructed a young boy, and the two set about separating the refuse into sacks. “Plastic and beer bottles are kept separately and sold later,” he explained. At the dhalao near Ambedkar colony in east Delhi, workers and waste-pickers are joined by dogs, crows and the odd-cow. Here too, similar scenes of industrious waste-segregation plays out. Except, no one is a government employee. “I have been working here for a decade. I have never heard of residents sorting their waste. This means I can make about Rs 100 per day by selling waste,” said a migrant from Bihar. At the MCD building at New Rajender Nagar, sanitation workers explained that “garbage is gold”. “We try to collect as much as possible and take it to the dhalao near Baba Sula Singh Marg. They may pay us only Rs 8, 000 per month but private contractors make a lot of money selling garbage,” Harkesh, a sanitation worker, said. At the MCD auto workshop at Jhilmil Colony, garbage is similarly valued. “But the problem is that the entire burden of separating waste has fallen on the workers. No resident knows, the corporation also does not seem to care,” said Shushil Vats, a worker.